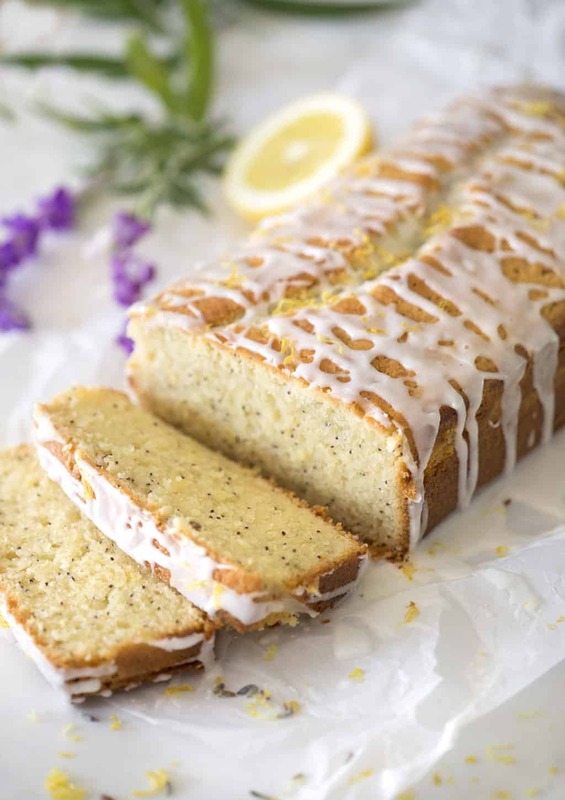 A sprinkle of lavender adds a wonderful botanical nuance to this delicious lemon poppyseed pound cake. This recipe makes enough batter for a nine by four inch loaf pan or three six inch cake pans. So if you wanted to get fancy you could make this as a layer cake paired with a lemon buttercream. I had to cut this loaf up right after photographing it and give most of it away because I had ZERO portion control around it! If you don’t have any culinary lavender hanging around then make this recipe without it and I guarantee you’ll still love it! This pound cake is beyond addictive, which is really dangerous when a recipe is this easy to make! I think poppy seeds get a bad wrap because of sad, stale, and often oily store-bought muffins. In this cake they add a wonderful pop of texture and I love the way they look suspended in each slice, like nature’s sprinkles! I maxed out the lemon juice in this recipe, filling each bite with a wonderful zing. The glaze is so simple but amazing, confectioners’ sugar whisked with fresh lemon juice. It hardens for a wonderful crunch and tastes like lemonade! I garnished my cake with some extra lemon zest but this is totally optional. Did I mention these would make amazing cupcakes? Just adjust the baking time to closer to 25 minutes. 1. Preheat oven to 350 degrees F. Add parchment paper to a loaf pan. In a medium bowl, sift together flour, salt, baking powder and sugar. 4. Zest and juice lemons. Microwave the milk so that it is warm to the touch. Sprinkle in lavender and lemon zest to infuse. 5. In another bowl, combine sour cream and butter. 7. Pour in the infused milk mixture and eggs. 8. Whisk everything together. Pour the wet ingredients into the dry. Mix until combined. 9. Pour the batter into the prepared baking loaf pan. Bake for about 60- 90 minutes or until the center is set and the edges are slightly pulling away. 10. In a bowl, add confectioners sugar. 11. Add the juice from 1½ lemons. Mix until you reach a desired consistency. Make sure not to add too much liquid at the beginning. 12. Drizzle the glaze over the loaf. Zingy lemon with a touch of delicate lavender! Preheat the oven to 350 degrees F. Add parchment paper to a loaf pan. Zest a lemon. Microwave the milk so that it is warm to the touch. Sprinkle in lavender and lemon zest to infuse. 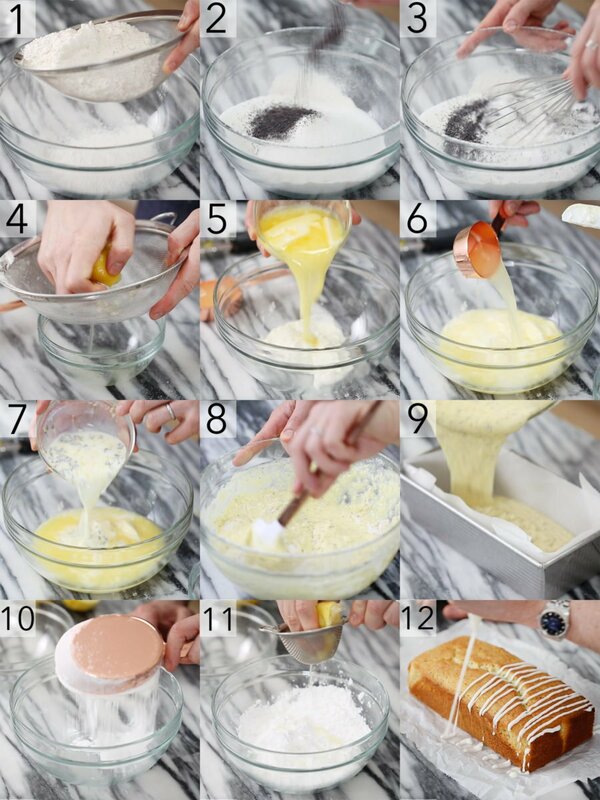 In a medium bowl, sift together flour, salt, baking powder, sugar and poppy seeds. Juice lemons until you get about ⅓ cup lemon. In another bowl, combine sour cream, butter, lemon juice, infused milk mixture and eggs. Whisk everything together. Pour the wet ingredients into the dry. Mix until combined. Pour the batter into the prepared baking loaf pan. Bake for about 60- 90 minutes or until the center is set and the edges are slightly pulling away. In a bowl, add confectioners sugar and the juice from 1½ lemons. Mix until you reach a desired consistency. Make sure not to add too much liquid at the beginning. Drizzle the glaze over the loaf. If you don't have sour cream handy use plain yogurt instead. The glaze is so simple but amazing, confectioners' sugar whisked with fresh lemon juice. It hardens for a wonderful crunch and tastes like lemonade! I garnished my cake with some extra lemon zest but this is totally optional. Did I mention these would make amazing cupcakes? Just adjust the baking time to closer to 25 minutes. How long do you recommend warming the milk in he microwave? Or could it be done over low heat on th stove? Heat the milk until it is warm to the touch! This can be done on the stove or microwave for about 30 seconds! Warming the milk will help to infuse the flavors with the added lavender and lemon zest! Hope you enjoy! Hello! Can i change the sour cream for cream cheese? Or what can I use instead? I don’t know about the cream cheese, but if it works let me know! I would suggest substituting with plain yogurt! This sounds delicious! Where can you find appropriate lavender to use in this recipe? And also, if you are infusing the milk with the lavender and lemon zest, do you strain out the lavender and lemon zest before mixing it with the other ingredients or leave them in the milk? Leave the lavender and lemon zest in after the milk has been infused! I hope you enjoy! The lavender isn’t necessary! I understand that it can be hard to find culinary lavender! Hope you love this pound cake!! Hi John, I’ve never used lavender in a recipe before, is this a strong flavor? Is the lavender an extract or an oil. I’m sorry for so many questions, but I have never used this before and I’m intrigued. Thanks so much. The culinary lavender used in this dish is not very strong. I used dried culinary grade buds and infused them in warm milk with lemon zest. It’s a nice, subtle taste! Hope you enjoy! Thank you for your response and this recipe. Also, thank you for such a beautifully organized website. Everything is laid out perfectly with precise instructions and pictures. Well done! Hi John, could this be baked in a bundt pan? And if so, how long would it need to bake? Thanks! You can absolutely bake this in a bundt pan! I hope you love it! Thanks John! Can’t wait to try it!!! I didn’t have lavender or poppy seeds, but I couldn’t wait to bake this loaf, so I made it without. It is sooo good. Moist, lemony, with a sweet-tart glaze, this recipe is a keeper! Use 190g unsalted butter in this recipe! I know you’re going to love it! I’m so happy! You can find culinary lavender online or sometimes in herbal stores! Hope you enjoy! This recipe is becoming my spring season go to! Its incredibly moist!! The tart lemon makes it feel so light and refreshing. The first time I made it, I substituted sour cream for creme fraiche… delicious! Thanks for the delicious recipe! All the credit I get from fellow Moms goes back to you. I’m so happy you liked it! Thank you very much! Can I use olive oil instead of butter? If it is a yes, will it be 3/4 cup oil or less? I think that will work! Let me know how it turns out! And it was absolutely beautiful and moist!! That is a great idea and sounds delicious! I may have to try that next time! Greetings from Merry Olde England! 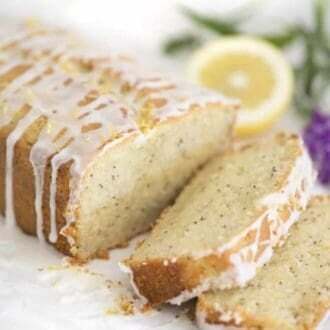 Have just made your lemon poppy seed pound cake (infused with lavender from our back garden) and it was glorious. I’d like to try one of your layer cakes next. I’m a novice baker and cake decorator, so what would you say is the easiest cake and most foolproof buttercream to attempt? Love your YouTube channel as well as this fabulous site; everything is just SO well done! Hi Rob! THat’s one of my favorite cakes!! So happy you liked it. Trying to think of the easiest cake to try. Try my blueberry lemon cake but be careful not to make the filling running. It was a snow day in Winnipeg Canada today so I thought of trying this recipe. Best lemon pound cake ever! I baked it for 60 minutes and it’s perfect! I can’t wait to try your other recipes. It makes me happy to hear you enjoyed the pound cake! 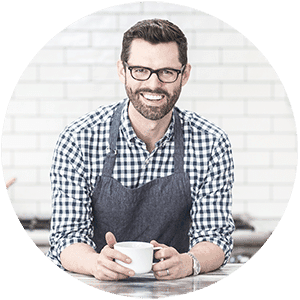 What recipe will you try next? I made this lemon loaf in a heart shaped pan today since it’s Valentine’s day. It was sooooo delicious and super moist. It smelled heavenly! I forgot to line my pan with parchment paper so the bottom and sizes were caramelized and hard. Overall we really enjoyed it.